Full of fresh late summer veggies! I keep telling myself I have to stop putting zucchini recipes on here this summer, but then, the next thing I know, there is a plate of some sort of new zucchini thing sitting in front of my camera. 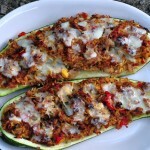 It’s like the zucchini are taking over everything – my garden, my mind, my blog, and most especially my dinner! I tell you – they are insidious! But today, I could not be more glad, because this is an absolutely fantastic meal. 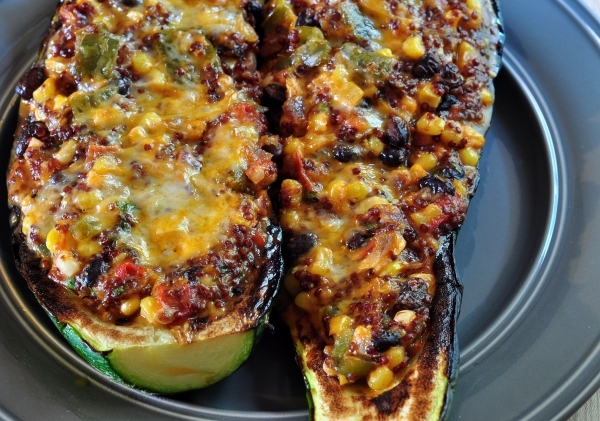 Ready in no time, it can be vegetarian or made with ground turkey for meat eaters, and it is low fat, gluten free and utilizes a bunch of nice fresh veggies that are so abundant right now. 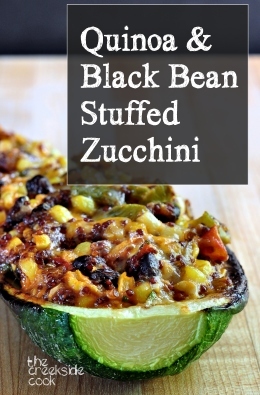 I made both versions when we had these stuffed zucchini for dinner the other night, and you almost could not tell the difference between the vegetarian ones and the ones with meat. The quinoa adds such a hearty texture, and rich flavor that next time I’ll not even bother with the meat lovers version, because neither of us will miss it. 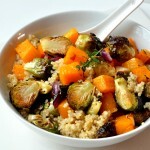 Quinoa also packs in a ton of nutrition, protein and fiber, making this a nice substantial family meal. It’s even adaptable for vegans, by leaving out the cheese, or substituting a vegan cheese instead of the shredded blend I used. It might or might not work for a low-carber as well, depending on your specific plan, but quinoa works pretty well for a lot of low carbers, and you can always reduce the amount a bit more if you like. You can amp up the heartiness of this a bit, by adding ½ pound of ground turkey, which has been browned in a bit of olive oil. 1 medium sweet green pepper, cored, seeds removed and cut in a medium dice - about ½ inch. Cut the zucchinis in halves, the long way. Use a spoon to scoop out the centers, reserving for the stuffing, leaving a good half inch of flesh all around to form a stuffable "boat"
Brush about ½ teaspoon of olive all over the cut sides of the squash, and arrange the halves on the baking sheet, cut sides facing up. Place pan with squash under the broiler - the rack should be adjusted to leave a couple inches space above the squash. Check frequently, and turn the pan so the surfaces brown evenly. You want some nice color, but the squash should still be fairly firm when you take it out. Leave the broiler on, as you are going to need it again in a few minutes. Over a medium flame, heat a tablespoon of the olive oil in a large saute pan. Meanwhile, chop the flesh from the squash, and add to the pan. Add the onion, pepper, corn and black beans and stir fry for a couple minutes. Add the garlic, cumin, oregano and hot sauce, and mix to combine. Add the quinoa and stock, and cover the pan. Lower the heat a bit and cook until the quinoa is tender - about 15 minutes, adding additional stock or water, if things start to stick at all. Remove the lid, and mix in the diced tomato, and the cilantro. Mix in ½ cup of the cheese. Portion the stuffing evenly among the browned zucchini halves [you may have a little stuffing left over], and top each one with ¼ of the remaining cheese. Return the pan to the broiler for a couple minutes, until the cheese is melted and bubbly - watch carefully so that it doesn't burn. Serve individual halves, or cut into slices for smaller portions. Can be garnished with avocado, hot sauce, chopped cilantro and some sour cream if you like. A nutritious, very tasty meal, ready in about a half hour. 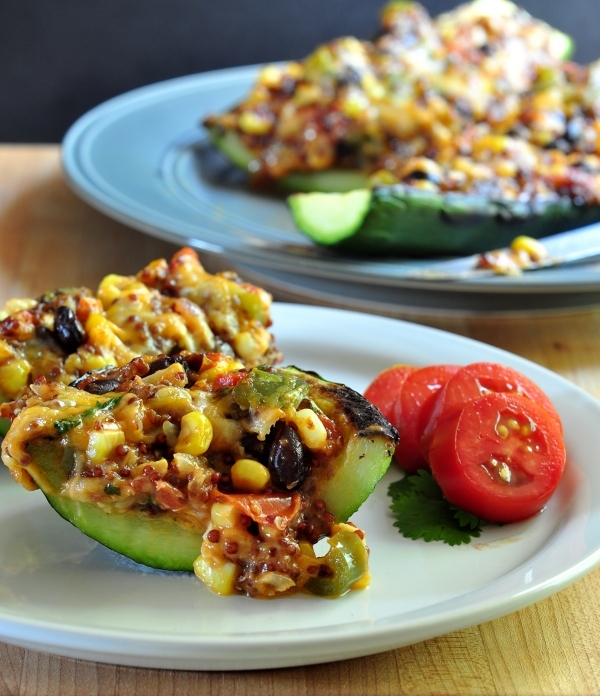 Very adaptable, to use the ingredients you like and have on hand – change up the added veggies, the grain, the cheese. this is a dish that you can make your own! Well, we grow our own of course, so we can let them get as large as we like. For most other dishes, I definitely want smaller ones, but this size is perfect for stuffing. This will make a nice solid hearty meal on the weekends! It definitely would Michelle – thanks! OMG this looks too good! I mean way too good! I would love this on my dinner table too. They look so good! I just tried quinoa with black bean for the first time and loved it! 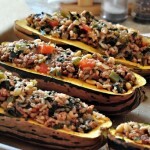 I Greece we stuff zucchinis with rice and minced meat. I love your version! Hi Darlene – so sorry, it got lost in the ingredients – fixed now! looks so healthy and tasty! YUM! made this tonight and it was so delicious! My whole family loved it. I think the black beans are missing in the directions though. Like when to put them in. I don’t see where the black beans are supposed to be added. Guess I’ll wing it. 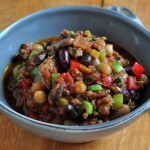 So sorry, those black beans were elusive little buggers in this recipe – all fixed now! Just made these for dinner. Delicious thank you! I’m giving up meat for a while and this was the perfect combination of deliciousness, healthy veggies and protein. You’ve got a new fan ? Thanks Bella! So glad that you liked it! These are delicious! I’ve made it twice now. I use the leftover stuffing for omelets and a burrito filling. I made this for supper tonight and was VERY good. Will definitely make again and again. 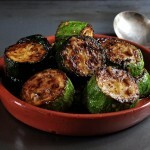 Does the zucchini excrete water esp if I made beforehand and served later? 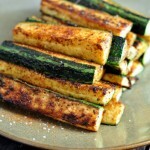 It might somewhat – that is going to depend on how juicy the zucchini is. I don’t recall letting it sit more than an hour or so before baking. I think it would be fine though.